Now you get the double number of songs! Offer valid until end of the week. Hurry Up! NO access to our streaming karaoke library. Download 100 karaoke songs! NO access to our streaming karaoke library. Lifetime, Unlimited access to additional 50,000+ streaming karaoke songs. Note: The unlimited streaming karaoke is available without limitations except that you cannot download the songs. Streaming karaoke songs are marked with the "Gold Members" sign. Your account will never expire. You can download any song from our whole collection at any time you wish! Purchase easily on-line using any Credit/Debit Card, PayPal, Check or European Direct Debit (ELV). The transaction is done via secure server. Your credit card number is directly transmitted to the banking network. The information is encrypted and it cannot be observed by a third-party by any means. Credit card processing is done via Clickbank company. Satisfaction Guarantee: Not Satisfied? No Problem. 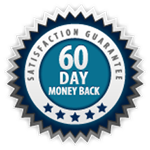 We are so confident about our product, that we back them with a 60 day no questions asked money back guarantee. So, if you are not 100% satisfied with your purchase, within 60 days from the purchase date, we will fully refund the cost of your order.